Section headings and selected papers: Preface. Organizing committee. Copper Tankhouse Practice. The Kidd copper refinery, J Laezza et al. Tankhouse modernization at CCR, J Thiriar et al. Mechanization of Inco's copper cliff copper refinery tankhouse, A L Cruthers & E W Hodkin. The design and engineering of copper electrowinning tankhouses, J A Wells & W R Snelgrove. New Developments. Influence of the main parameters on zinc powder electrowinning in caustic soda medium, J Frenay et al. Recent improvements in zinc alkaline hydrometallurgy, D L Piron. Pilot plant studies for the production of electrolytic manganese dioxide and manganese metal, P L Sen Gupta. Fluidized-bed electrodeposition of heavy non-ferrous metals, S L Tsapakah & L V Volkov. Purification and Electrolysis. Effect of organic additives on the kinetics of cobalt purification, G Houlachi et al. Removal of cobalt and manganese from zinc sulphate solutions, J C Fonseca. The production of particulate manganese dioxide during zinc electrowinning, J M S Rodrigues & M J Dry. Operating practice and technical developments in nickel refining and cobalt recovery at Jinchuan non-ferrous metal company, Yang Yuhua & Meng Xianxuan. Modernization, Automation, and Monitoring. Advances in copper tankhouse automation, J Bosscher & W Berends. New cell house operation at CEZ, M J Agnew & G Monteith. Inco copper refinery addition agent monitoring using cyclic voltammetry, B R Conard et al. Morphology modifier monitoring by polarization measurement, R E Alford. Monitoring of organic additives in electrolyte at Cominco's lead/zinc operations, R C Kerby & W A Jankola. Authors index. 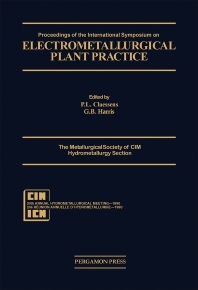 The Symposium covers most of the aspects of modern aqueous electrometallurgical practice, with a stronger emphasis on copper than zinc and nickel, which can be regarded as being the three major electrolytic metals. Of the minor electrolytic metals, there are contributions describing cobalt, lead and gold electrometallurgy, as well as the production of electrolytic manganese dioxide. The sessions divide neatly into modern copper tankhouse practice, purification techniques, modernization and automation, and new developments. A cross section of worldwide practice is represented, with a perhaps understandable concentration of Canadian operations. Plant tours to a modern zinc electrowinning operation, CEZ Inc at Valleyfield, and one of the world's largest copper refineries, Noranda Minerals, Inc., CCR Division in Montreal East, have been included as an integral part of the Symposium. For metallurgists, engineers, technicians, and plant operators/managers in the field.